Melanerpes candidus approaching the nest of social paper wasps. Photo by Miguel Rangel Jr. used under terms of a CC-BY-SA licence. 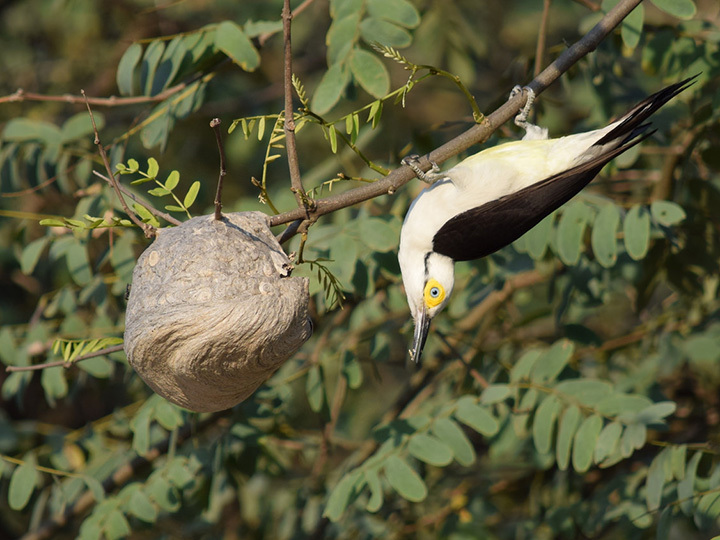 In the latest issue of Revista Brasileira de Ornithologia, I found a paper on a topic near and dear to my heart: birds preying on wasp nests. 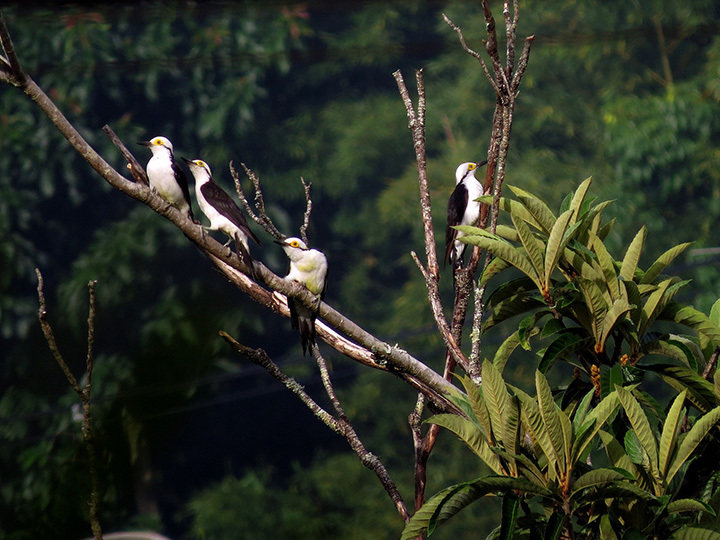 In this case, it is an account of the White Woodpecker, Melanerpes candidus preying on the nests of Polybia paulista. In this paper, Ivan Sazima describes the predation tactics used by this woodpecker when attacking a large, well-defended nest. Ivan conducted this research at Parque Ecológico Prof. Hermógenes de Freitas Leitão, in the state of São Paulo, Brazil. Like the Red-throated Caracaras I studied, the White Woodpecker appears to exploit the absconding response of these swarm-founding wasps in order to secure its meal of wasp brood. Rather than inflicting rapid, catastrophic damage, however, the woodpecker takes its time, approaching the nest gradually and tapping the branch to which the nest is attached. During this approach, some of the wasps come out to sting, and if this gets too fierce, the woodpecker will retreat. Sazima attempted this tactic himself with a similar nest of P. paulista, and got stung severely for his efforts. Sazima suspects that the continuous nature of the woodpecker’s disturbance is what is required to induce the wasps to abandon their nest. Also, the agility of the birds at evading attacking wasps also means they can keep this harassment up longer than an unprotected human. This paper is a valuable contribution to the study of wasp and bird behaviour, as it highlights that certain anti-predator strategies of social wasps (stinging, alarm recruitment) can be defeated by exploiting the evacuation swarming (absconding) behaviour of these wasps. Bearing this in mind, it is no wonder that so many species of swarm founding wasps have cryptic nests to escape the detection of diurnal vertebrate predators. The foraging behaviour of the White Woodpecker reported herein results from so-called anecdotic, natural history oriented observations, often disregarded by theory-trained biologists. Nevertheless, this kind of observation draws attention to phenomena that later may prove more widespread or commoner that previously thought. I could not agree more. Please head over to read the paper yourself, as the photos of the behaviour are great, and the text well worth the read. Update: See another wasp predator in action here. Photo by Márcio Vinícius Pinheiro, shared under the terms of a CC BY-NC-ND 2.0 licence. “During this approach, some of the wasps come out to sting, and if this gets too fierce, the woodpecker will retreat. Sazima attempted this tactic himself with a similar nest of P. paulista, and got stung severely for his efforts.” Crazy experiment! I did some similar tests, but I was wearing a bee suit at the time!